Topics: Who We Are, List Of Chapters, Dava Eligibility/dues, List Of Auxiliary Units, and Dept/state Officers. 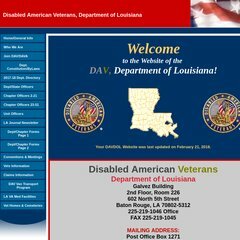 Davdol.org's IP address is 206.188.193.15. Its 2 nameservers are ns22.worldnic.com, and ns21.worldnic.com. It is hosted by Monstercommerce Llc (Illinois, Belleville,) using Apache/2 web server.